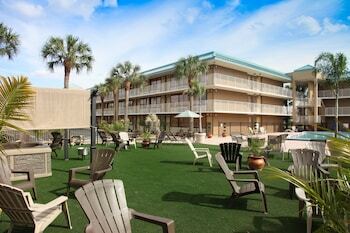 This Kissimmee hotel is located only 1 mile from Walt Disney World Resort and 8 miles from SeaWorld Orlando. Very slow check in especially for a paid in full reservation. Outside property is run down looking. Kind of creepy at night especially. Beautiful inside though, really nice rooms. Lots of space! Where to find Kissimmee hotels near an airport? How can I find hotels in different Kissimmee neighborhoods? Where can I find hotels in Kissimmee that are near tourist attractions? Visitors to Central Florida will find plenty of hotel options to choose from in Kissimmee. Expedia currently lists at least 118 comfortable places to unpack your bags within 0.1 kilometres (0.1 miles) of downtown Kissimmee. 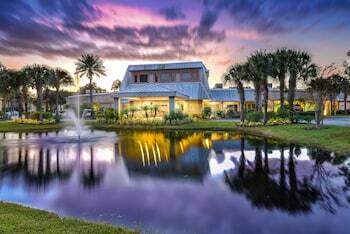 Securing a place close to the bright lights of inner city Kissimmee has never been simpler. Expedia's comprehensive database features the CND Holiday Homes and Holiday USA, which you'll find within 1 kilometre (0.6 miles) of Kissimmee's city center. 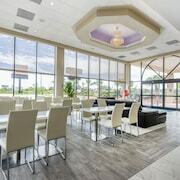 The Super 8 Kissimmee Suites and SVH Kissimmee Area Gold Collection are conveniently close to Kissimmee Civic Center, while the Satisfaction Orlando Resort and Satisfaction Orlando Beach Resort are situated near Kissimmee Lakefront Park. Hotels near Brinson Park include the Lambert Inn and Budget Inn East. Accommodation options nearest to Lanier's Historic Downtown Marketplace, include the Golden Orchid Inn and Golden Orchard Inn. 20 kilometres (12 miles) away from the main part of Kissimmee, is the Disney's Animal Kingdom Villas - Kidani Village. Alternatively, the Disney's Beach Club Villas is positioned 17 kilometres (11 miles) away. Two other hotel options worth looking into are the Bay Lake Tower at Disney's Contemporary Resort and the Boulder Ridge Villas at Disney's Wilderness Lodge. If you are inspired to see more of the wetlands that feature in this area, you might also book some time in other parts of Central Florida. Enjoy hiking and picnicking or make a trip to the region's attractions. 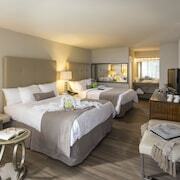 Comfortable hotel accommodations are offered. Downtown Kissimmee is 0.1 kilometres (0.1 miles) to the north of Kissimmee, and is home to the Bataan-Corregidor Memorial and First United Methodist Church. The Magic Landing and Oak Plantation Resort - Vacation Villas are just some of the great hotel options in Downtown Kissimmee. 14 kilometres (9 miles) to the northwest of Kissimmee is Disney's Maingate East, home to the Disney's Old Key West Resort and Disney's Saratoga Springs Resort & Spa. The Wizardz Magic Theater and Fun Spot America are just a couple of the more popular attractions to check out when you're in Disney's Maingate East. Orlando International Airport is a logical airport for flying into Kissimmee. It is 18 kilometres (11 miles) away. 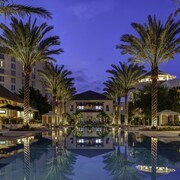 If you plan to stay nearby, try the Hyatt Regency Orlando International Airport or Residence Inn Orlando Airport. Theme parks are not your only option when you visit the city. Kissimmee also has some of the best attractions in Florida including a wide range of golf courses. Many of these courses are well designed and provide you with a fun challenge, whether you plan to hit a quick nine holes or stay the afternoon to play the full course. If you want to learn more about the area, there are also a few good museums to check out. For dinner, you can sit back and relax while taking in a show at one of many dinner theaters in the area. 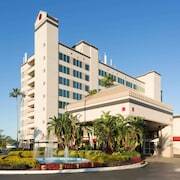 Special hotels Kissimmee, Florida options are also available - including pet friendly hotels - when you want bring the family pet along on vacation. 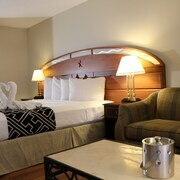 Cheap Kissimmee hotel deals are easy to get when you book with Expedia. 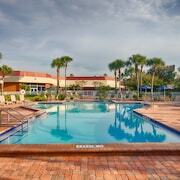 Here you can get discount rates and specials for any type of Kissimmee hotels you need. 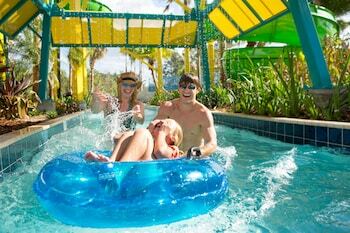 You can also get deals by adding car rentals and flights to Kissimmee when you book hotels in Kissimmee. Expedia can help you save money so you can have a vacation that suits you and your family. What are the most popular Kissimmee hotels? Are there hotels in other cities near Kissimmee? 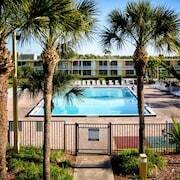 What other types of accommodations are available in Kissimmee? Explore Kissimmee with Expedia.ca’s Travel Guides to find the best flights, cars, holiday packages and more!